The Knights of Columbus - Assembly #2381 may also collect aggregated data, which is data from which the identity of an individual cannot be determined. Since it is not personal information, the Knights of Columbus - Assembly #2381 may use aggregated data in any way that it considers appropriate. specific volunteer opportunuties or general information about the Knights of Columbus - Assembly #2381, in the event you have created a personal profile; our logos, trademarks, events or other promotional purposes, including co-branded offers, if you have opted to receive such communications either through providing your email address on the home page of popknights.org; Communicate, to the extent required, with and manage our relationship with the Knights of Columbus - Assembly #2381 consultants, strategic partners, agents, contractors and other companies affiliated with the Knights of Columbus - Assembly #2381 in order to improve the Knights of Columbus - Assembly #2381 offering of our services; and meet any applicable legal and regulatory requirement. In most cases, and subject to legal and contractual restrictions, an individual is free to refuse or withdraw his or her consent at any time upon reasonable, advance notice. 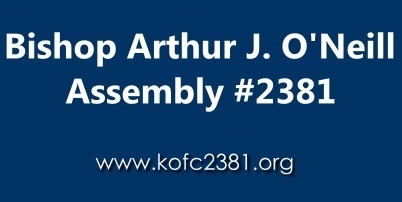 It should be noted that in some circumstances, certain the Knights of Columbus Assembly #2381 services can only be offered if a person provides personal information to the Knights of Columbus - Assembly #2381. If you choose not provide us with any required personal information, we may not be able to offer the services requested. We will inform you of the consequences of the withdrawal of consent. How do I remove or modify my personal information? the Knights of Columbus - Assembly #2381strives to ensure that any personal information provided and in its possession is as accurate, current and complete as necessary for the purposes for which we use that information. How is my personal information secured? The Knights of Columbus - Assembly #2381 strives to maintain appropriate physical, procedural and technical security with respect to its offices and information storage facilities so as to prevent any loss, misuse, unauthorized access, disclosure, or modification of personal information. Information from children: popknights.org is a general audience site that is not designed nor intended to collect personal information from children under the age of 13. the Knights of Columbus - Assembly #2381 does not knowingly collect personal information from anyone under the age of 13, and does not use such information if it discovers that it is has been provided. To respect the privacy of children and to comply with the Children's Online Privacy Protection Act, children under the age of 13 should not provide any personal information on this Site. We ask that parents supervise their children while online.